Whether or not they noticed the symbolism on the starting line, more than a thousand runners sprinted into the darkness at the Fairfax Four Miler, a scant six hours before the new year began. [button-red url=”http://results.bazumedia.com/event/results/event/event-626″ target=”_self” position=”left”] Results[/button-red]The circumnavigated the George Mason University campus and headed back to the finish line in old town Fairfax. 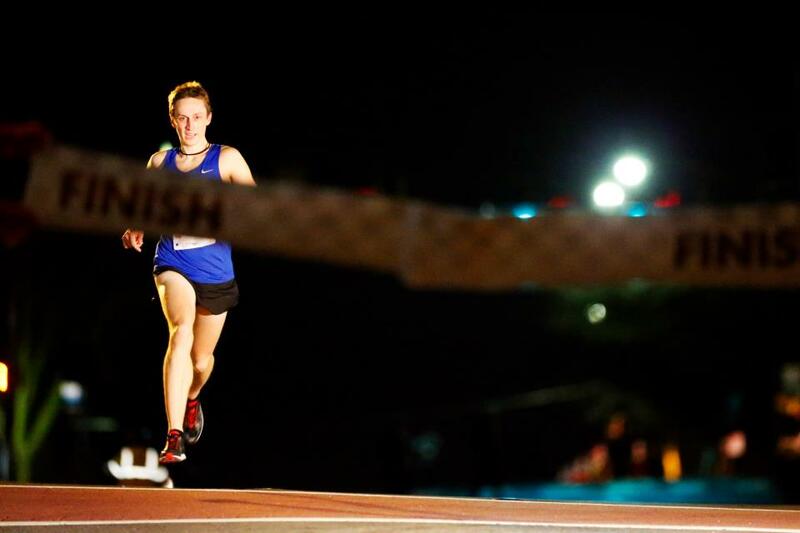 The latest-scheduled of the many New Year’s Eve races, it gave runner a chance to take a stab and a rarely-run distance and a chance for a PR before they went about celebrating the new year however they chose. About 20 minutes after he left sight, Alex Benway, of Reston, careened down the hill to break the tape in 20:46, ahead ofEdmund Burke’s 21:10 . Benway ran without a watch and spent two miles catching up with Burke, of Burtonsville, Md. Again, was it symbolism, the spry 22-year-old passing a man who could legally drink champagne the day he was born? Perhaps not, but it gave the recent Clarkson University graduate the kind of race he needed, firm pavement after spending 10k picking his feet out of mud three weeks prior at the USATF Club Cross Country Championship in Lexington, Ky.
Benway, nicknamed “Viking” for his Nordic skiing pastime, was recently named rookie of the year for the Georgetown Running Club. On the women’s side, Anna Corrigan, a graduate student at the University of California, outlasted course record holderMindy Sullivan of Woodbridge, 22:36 to 22:47. Corrigan never really got an idea of her positioning during the race. A 10k specialist while an undergrad at the University of Virginia, Corrigan was pleased to run four miles, rather than 5k. She and her friends chose the race earlier in the day. A Burke native, she ran at Lake Braddock High School, which recently won a state cross country title. Katie Sheedy, of Washington, D.C. came back to the race after trying it out in 2011, and brought a few friends along before they convened for a potluck. She ran faster than last year, despite not fully committing to racing at the time. “It was just a great way to finish of 2012 and get ready to start 2013,” she said. Her friend Joe Coyne, of Washington, managed to edge Jennifer Leehey, bringing his record against her this year to 1-7, or 1-8. The runners in the crowd had a variety of new year’s resolutions related to their running. Kristina Mickey, of Fairfax, Va., hopes to be able to maintain 8:00 pace for 5k. “We’ll see how that training mixes with my Crossfit,” she said.